Set within the exclusive Malibu development of beachfront apartments and penthouses, this is one of the finest properties for sale in Puerto Banús. The three-bedroom home measures over 220m2 of interior space, with a panoramic southwest-facing terrace of 115m2 that enjoys truly spectacular sea views. The sunsets that colour the sky orange as the sun dips behind the famous outline of Gibraltar are particularly impressive, and though highly private an additional feature of this penthouse apartment is the fact that it is walking distance from the famous marina of Puerto Banús. Marbella town, golf courses, shops, schools, fine dining and other amenities are also close by, while the luxury complex – one of the finest in Marbella – offers 24-hour security, beautifully tended subtropical gardens with elaborate walkways and three large swimming pools of which one is heated. Malibu also has a fully equipped gym with two indoor Jacuzzis for the exclusive use of residents. Inside, the properties are equally well finished, and the duplex penthouse enjoys the space and comforts of a luxury villa in a very convenient form. The heart of the home is the elegant living room with stylish fireplace, dining area and a fully fitted Bulthaup kitchen with top-spec appliances by Liebherr and Gaggenau. There is also a practical utility room, while the three well-proportioned and tastefully finished bedroom suites enjoy fantastic sea views and direct access to private terraces. The large main terrace is divided into different covered and uncovered areas that provide space for lounging, relaxing, dining and entertaining. The architectural styling of the property is timelessly contemporary and refined with delightful Mediterranean and colonial touches. 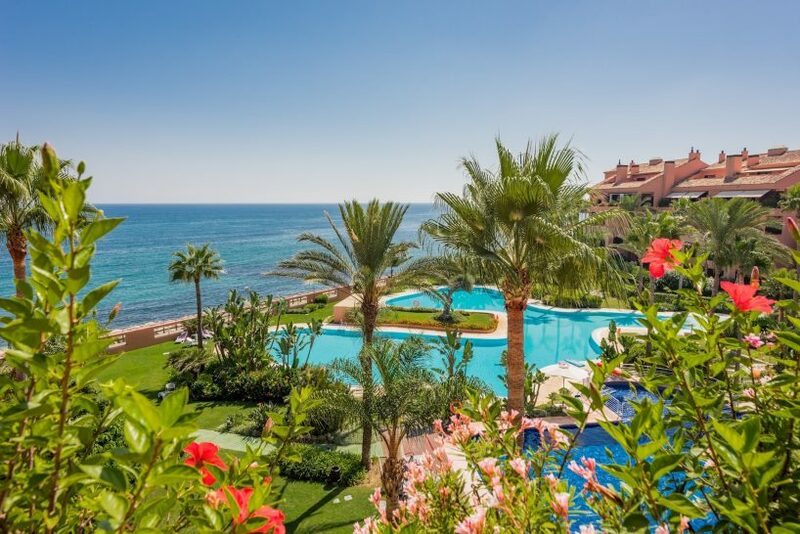 This superb frontline beach duplex penthouse for sale in Malibu, Puerto Banús, is one of the best in this prestigious gated complex, offering style, luxury, space and comfort in a top beachside location within walking distance of the port.